Walking down the isle of a Chinese vegetable store in Mississauga, Canada, after my immigration in 2004, I was surprisingly greeted by the Kasava/ Tapioca/ Kappa (കപ്പ) placed on a rack. On Closer examination, the tag read ‘Kasava – Product of Guatemala’. Any Malayalee (Mallu) will always and forever relish Tapioca cooked with spices and grated coconut and fish curry marinated with special tamarind (Kudam Puli (കുടംപുളി) scientifically known as Garcinia Cambogia). The concoction served in Toddy (alcoholic extract from coconut trees) shops all over Kerala (Indian Province where Malayalam is the native language and the residents are called Malayalees – now Mallus), is something one can never get in any homes. Tapioca is not a native of Kerala. Then how come it reached the shores of Kerala?. Tapioca is said to have originated in Brazil. Portuguese distributed the crop from Brazil to countries like Indonesia, Singapore, Malaysia and Kerala in India in the 17th Century. Some believe that Vysakham Thirunal, the Travancore King (1880-1885 AD), who was also a botanist, introduced this laborer’s food in Travancore (South Kerala). By beginning of 19th Century, people from central Travancore migrated to the Malabar region (North Kerala) and they introduced tapioca to the locals. Tapioca was promoted extensively during World War II in Kerala by Chithira Thirunal, Maharaja of Travancore and his Governor Sir CP Ramaswamy Iyer. Then rice was the staple food of the people of Kerala and was being imported from Burma and Indonesia. With Japanese Navy enforcing a blockade in the Malaccan Strait, the ships carrying rice to India were either destroyed or captured. This caused an acute shortage of rice. A large number of people, especially the labour class, accepted the starch-rich Tapioca as a substitute to costly rice. Thus Tapioca came to be known as ‘staple food of the poor.’ Hotels refused to include Tapioca in their menu due to its working class image. Only place that served Tapioca were the toddy shops, where the labourers turned up for relaxation after a day’s hard work. Today tapioca is a rarity in Kerala and so is a delicacy and hence all hotels including the five-star ones have tapioca with fish curry in all their menus. During my childhood, we used to cultivate Tapioca on our land. Tapioca is a tropical crop, tolerant to drought, but cannot withstand frost. It is best grown in lower altitudes with warm humid climate with well distributed rainfall. Our land is terraced on the hill slope into 20 x 20 feet sections. Each section is held together with stone masonry retaining wall to avoid soil erosion. On top of these walls pineapple was grown to give additional strength to the retaining wall. On some of these walls a fast growing grass was planted as fodder for cows. In the month of August, the labourers would till the land and make mounds of about a foot after spreading a compost mixture of cow-dung and ash. These mounds are made about three feet apart. Tapioca is planted in June with the onset of the South-West monsoon. Stakes taken from plants of the previous year is now cut into pieces of about a foot and is planted on these mounds. After a month, all the unhealthy or weak sprouts are pinched off leaving only two sprouts to grow into stakes. As the plants mature, underground stems called tubers enlarge with starch. This is the time when the plant is most susceptible to rodent attacks, mainly from rats. As the tubers matured, a plant was uprooted almost every evening and tubers either were boiled and eaten with chutney or cooked with grated coconut and spices and eaten with fish curry. During weekends our mother had off being a school teacher and she would make thin slices of fresh tapioca tubers and fry them in coconut oil. After about ten months, in April, tapioca is harvested. Firstly the stakes are cut off and the healthy ones are stored for cutting for next planting. Underground tubers are now pulled out manually, pulling at the base of the stakes. The tubers are cut off from their bases and carried to the peeling site. In the 1980s, labour in Kerala became very expensive and rodent attacks on tapioca crops became severe. 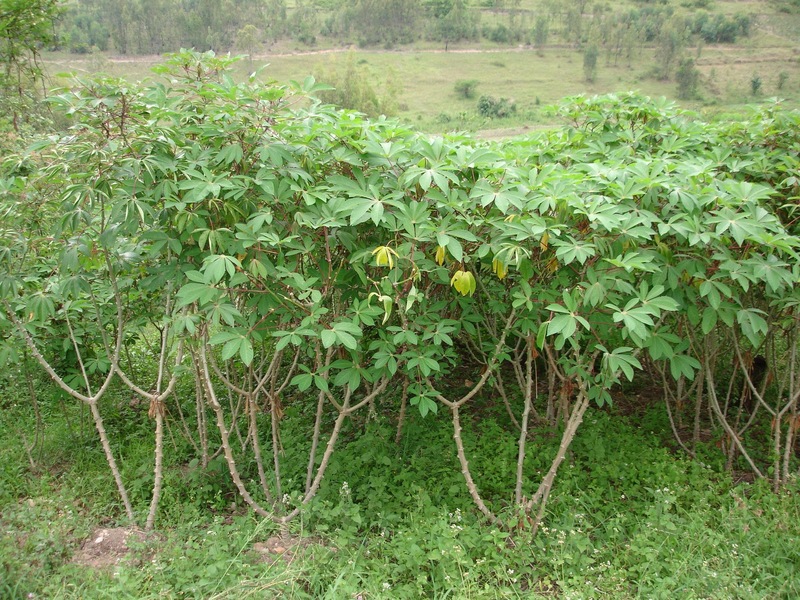 Most tapioca plants were infected with Gemini virus causing ‘Mosaic’ disease curling the leaves and thus reduced yield. In this period, the price of natural rubber skyrocketed. This turned tapioca farmers to rubber cultivation. With the incoming of rubber, out went the cows first as there was not enough grass to feed them. Further, the skins of the tapioca tubers and leaves from the uprooted stakes, which were the staple diet of the cows for four months, were now unavailable. Mr AD George, our botany teacher at school had mentioned that the Gemini virus intruded into Kerala through a sample brought in by a professor, who while on a visit to a foreign country where tapioca was cultivated, saw a plant infected by the virus. He collected a leaf to show it to his students and brought it home to Kerala. After demonstrating the specimen to his students, the professor discarded the specimen. This virus then is believed to have spread across Kerala. The land lost all its herbal healing powers with the advent of rubber cultivation. Herbal plants like Kurumtotti (Sida Rhombifolia), Kizhukanelli (Phyllanthus Amarus), Paanal (Glycosmis Arboraea), etc, all very abundant until we cultivated tapioca, became nearly extinct. The undergrowth shown in the image above is mostly of these herbal plants. Further, the present generation is totally unaware of the existence of these herbs in our own land and uses of these herbs. The cows used to eat these herbs along with the grass they chewed off the land and hence their milk also should have had some herbal effect. In 2002 I visited Colonel TM Natarajan, my class mate from Sainik School and he spoke about the Sago (Sabudhana[साबूदाना ] or Chavvari [ചവ്വരി/ சவ்வரிசி]) factory his family had. That was when I realised that Sago was not a seed and it was factory manufactured and tapioca is the main ingredient. As Tamil Nadu had many Sago factories and in order to feed them with tapioca, tapioca cultivation now moved from Kerala to Tamil Nadu. The only hitch is that it needs extensive irrigation to grow as Tamil Nadu does not enjoy as much rainfall as Kerala is blessed with. ← Why Do Soldiers Break Step On A Bridge? Mouth watering. I do miss kappa. Our on Kanji is from China. One misses those good times. I hope the present generation reads this article and become aware of our life style in the past.